‘You get woken by a phone call and forget which language to use’ – some problems can only be understood by those who speak more than one language. A ‘first world problem‘ is a minor inconvenience for people who don’t have to deal with any pressing concerns – an advantage of living in a richer country or having a rich lifestyle. As such, it’s rarely something to genuinely complain about. 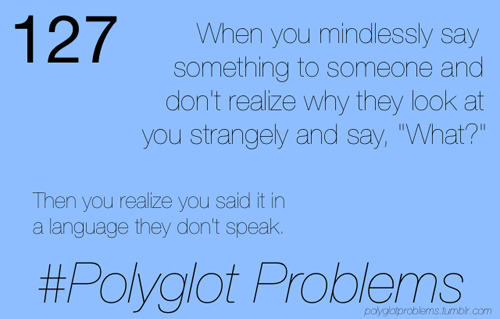 Along the same lines, a ‘polyglot problem’ is an inconvenience you only have to deal with when you speak multiple languages. It’s hardly grounds for saying your life is unfair, because you do have all the other wonderful advantages that gave you the inconvenience in the first place. 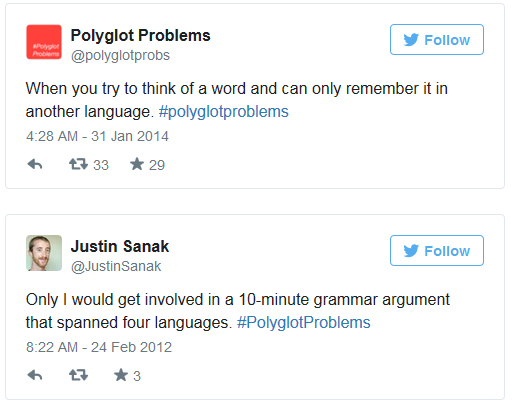 I’ve been seeing the hashtag #polyglotproblems gain grounds on twitter, Facebook and even Instagram, as well as get posted on other blogs, so I figured I’d write my own article sharing some of my ‘complaints’, as well as some of my favourites #polygotproblems posted online. 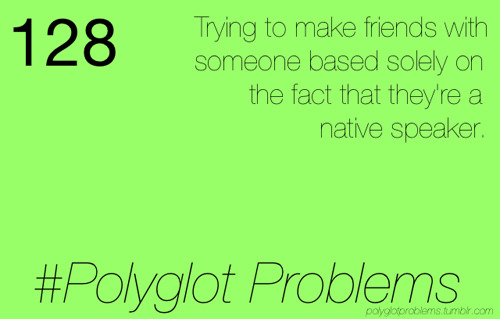 You casually mention the word ‘polyglot’ to someone not into language learning, and they think you have multiple lovers. When you bump into someone you’ve already met, and have that awkward few seconds where you can’t remember which language you spoke together and are waiting for them to say ‘hello’ or ‘how are you?’ first so you can figure it out. When someone discovers that you speak another language, and demand that you ‘say something in [that language]’. I find this to be a dull question. What would they say if I told them to say ‘something’ in their mother tongue? When you meet another polyglot, and have to spend the first few minutes deciding which of your common languages you can communicate best in. You get woken up with a phone call, and are too tired to remember which country you are in and if you should answer with ‘pronto?’ or ‘allo?’ or ‘bueno’. 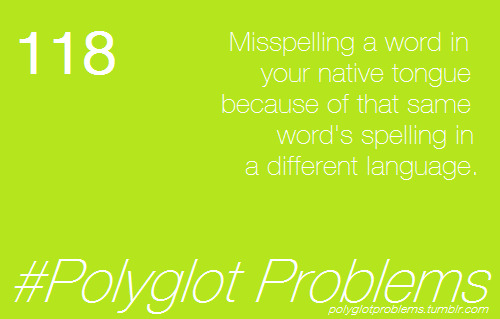 This is a trio of #firstworldproblems, #polyglotproblems, and #worldtravellerproblems. Signing up for a new profile on a site and selecting the ‘languages you know’ area and they only have two or three options. How am I supposed to pick just three? Couchsurfing has a more generous limit of 10 languages on your profile, but I still eventually had to remove ‘English’ so that I had room for other languages. When you receive emails on a daily basis that change language every sentence, since people think that’s how polyglots write and feel comfortable reading. When someone asks you why you’re learning that language, as if it’s impossible just to learn a language for fun. When people talk about you in a foreign language assuming you don’t speak it, but you do. When you begin parler en multiple idiomas at the same tiempo. When you procrastinate studying a language, by studying another one. When all you can think about is which language you’ll learn next, even though you can’t keep up with the languages you’ve already learned. “When you see a movie called ‘Agora’ and think it’s a Portuguese or Brazilian movie…but it’s really about ancient Egypt.” #PolyglotProblems—@annettecarinaa, January 27, 2012. 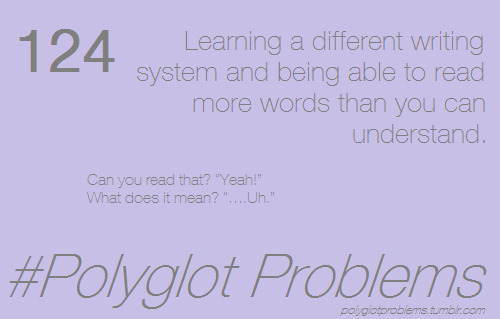 What #polyglotproblems have you run into in your language learning adventures? Share them with us in the comments! Reprinted with permisson of Fluent in 3 Months. Benny Lewis is an Irish pologot, speaking more than 10 languages. He’s a fun-loving, full-time globe trotter and international bestselling author, who was named National Geographic Traveller of the Year in 2013. 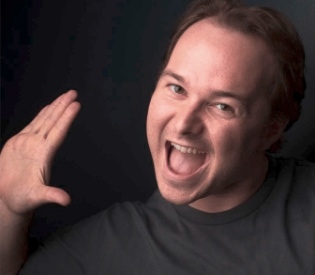 His mission in life is to give people permission to make mistakes to help them become confident language learners in as little as three months. You can contact him via his website, Facebook, or Twitter.